Misconceptions and lack of understanding dominate America's perception of Islam, the world's second largest and fastest-growing religion. Muslims takes an in-depth look at what it means to be a Muslim in the 21st century. 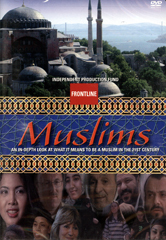 Filmed in Egypt, Malaysia, Iran, Turkey, Nigeria and the U.S.A., Muslims explores the influence of culture and politics on religion and provides a deeper understanding of the political forces at work among Muslims around the world. The film emphasizes Islam's kinship with Christianity and Judaism and looks at diverse interpretations of Islam among the Muslim people.